2-story colonial in Shorewood Hills! Professionally renovated & impeccably maintained home that is move-in ready. 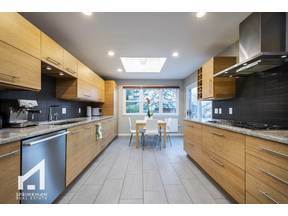 Full kitchen remodel w/high-end appliances, cabinets, tile floor, skylight, eat-in area & opens to formal dining. Sunny, large living room offers hardwood floors & wood burning fireplace. New windows. Updated electrical. Two bathrooms fully gutted & renovated. 4 bedrooms up & master suite w/ lg built-in wardrobes & bonus space that could be used for exercise room, office or extended for spa bathroom. Beautiful fenced yard w/ flowerbeds. ALL within walking distance to schools, parks, pool & shopping.